This isn’t a review. I just like how these pictures turned out. I know I already posted a picture of Orval in action, but I guess I’m slightly obsessed. Thanks for the glass Chris. Yes, you are reading this correctly. How is this possible? A flight to Paris, a rented car, getting lost in the Belgian country side, getting directions from a local working at a ‘tea room’ where they display pig legs on their bar, and the instinct of a Trappist enthusiast – myself. The moons aligned for a brief moment for myself as I walked out of the abbey shop where a monk sold me six Westvleteren 8’s and two gift sets, each with two goblets and one Westvleteren 12 (the holy grail of beer). Somehow, and I really mean it, somehow I managed to bring home all of this loot without any mishaps. So, Rob Nagy and myself took a moment to enjoy the splendor of the 12. Now I won’t go into heavy details of the beer because its virtually impossible to describe. Just look around the net at other reviews – no one can figure out the magic of this ale. But what I can say is “Holy Holy..” While different than the other Trappist ales, this one is smooth, extraordinarily rich in flavour, zero water-taste, and one of the most pleasant beers I have ever tasted. I’m sure that this marvel has a whole host of secret ingredients, prunes, raisins, caramel, cocoa, flowers, magic, whatever; but there is no way of knowing for sure. The Abbey of Saint-Sixtus is tighly sealed and you ain’t getting in to that brewery to take a look around. I did make one major mistake though. In all of my excitement I failed to look around and realize that there is actually a Westvleteren Cafe/Restaurant, called In De Vrede, that has all three beers on tap, local cuisine, Trappist cheese made at the Abbey, and a gift shop with who know what kind of marvels! This restaurant is not mentioned on the Abbey’s website, on the automated phone response that you get when you call the Abbey to have a hope in hell of securing a case of beer, or on any signs in the Saint Sixtus area. What a bummer! Well, I guess this isn’t a bad thing as I will definitely have a reason to revisit the Abbey of Saint Sixtus in the future. 6 heads out of 5. So Koningshoeven and La Trappe are the same product. For whatever reason, La Trappe is usually marketed as “Koningshoeven” in the USA and Canada. I’ve had the Koningshoeven a few times before (refer to the BFB banner above), but recently both the Tripel and the Quadrupel have been unavailable. Being a big fan of Trappist beers, I was extremely disappointed with the LCBO’s decision to stop carrying this fantastic beer (I was going to type out a massive rant on this topic, but decided against it). Anyway, I went to Hamilton’s own Winking Judge (by recommendation) tonight and was more than pleasantly surprised to see a tap which bore the label La Trappe Quadrupel. 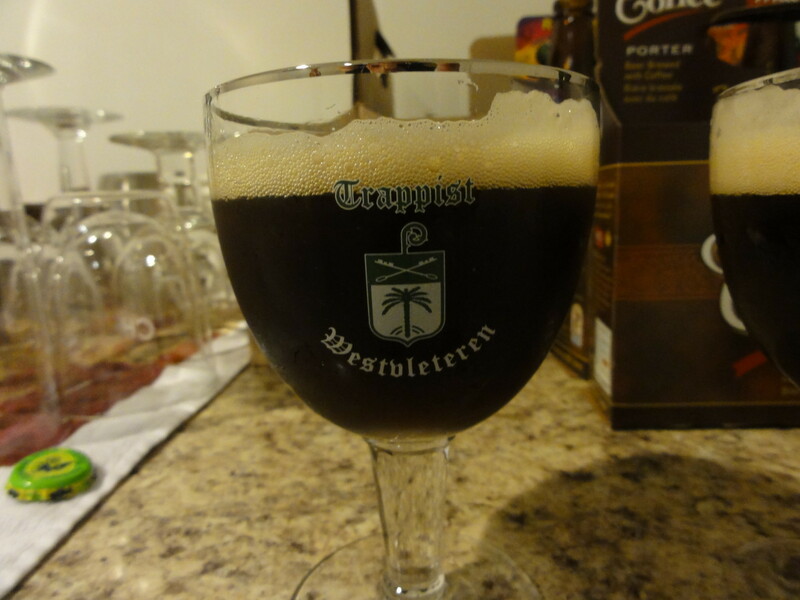 Needless to say, I ordered a glass, which was then expertley poured into… a La Trappe goblet. Excellent. Thumbs up to this establishment (which had lots of other great beers on tap, like St-Ambroise Oatmeal Stout and the new Mill St. Lemon Tea beer) and thumbs up to La Trappe and/or Koningshoeven for their sweet yet EXTREMELY strong Quadrupel. P.S. There’s some interesting beer drama regarding Konings and it’s involvement as a Trappist product. If you’re a big nerd, go check out the Wikipedia article. 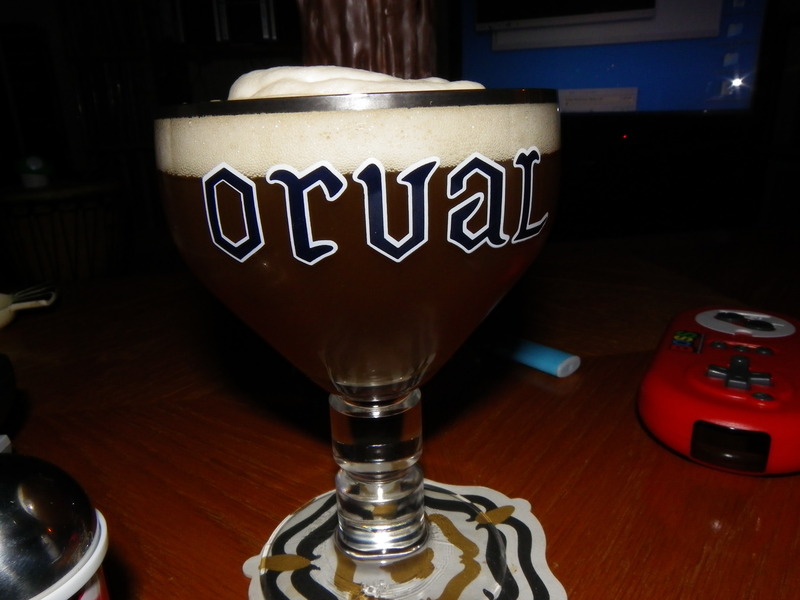 Just thought I’d expand on Tom’s post and upload this photo I had on my phone of Orval in action. This one needs to be poured with care. 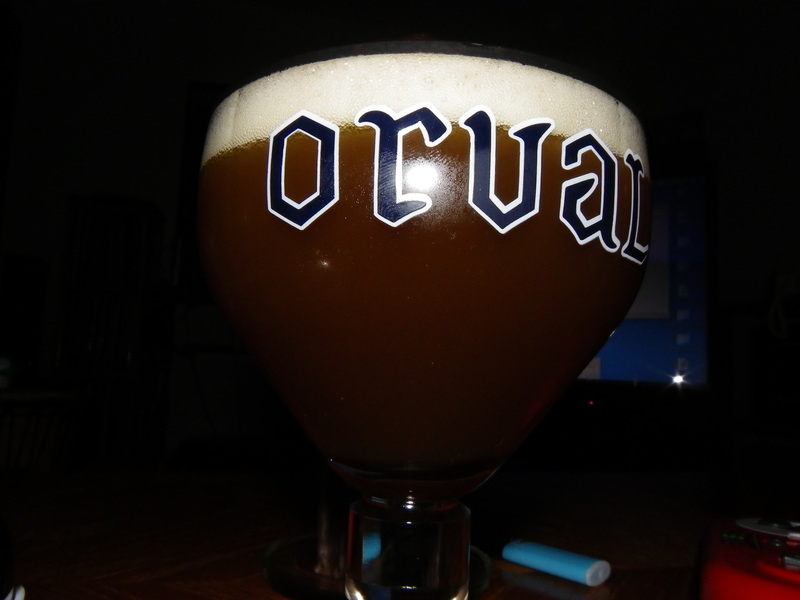 Someone get me an Orval glass. This opulent, complex beer gracefully fits in with the rest of the Trappist family, and in Belgium is referred to as the ‘Queen of Trappists’. 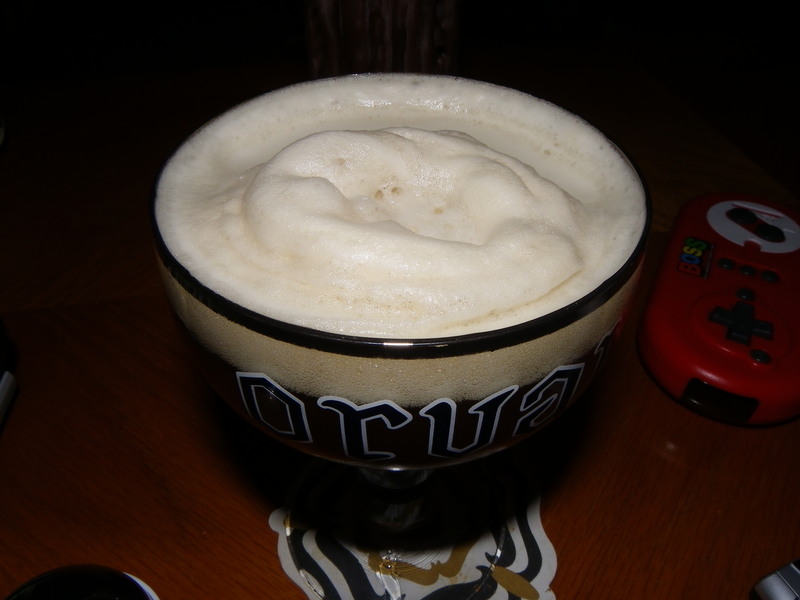 The beer is a beautiful yellow-amber color, slightly cloudy, with a thick head. The distinct flavour is earthy and unusually fragrant, produced through the utilization of a special variation of yeast. The aftertaste is mildly fruity and sweet, with little bitterness. The 6.2% alcohol content compliments the warm, radiant color and ‘muddy’ complexion. 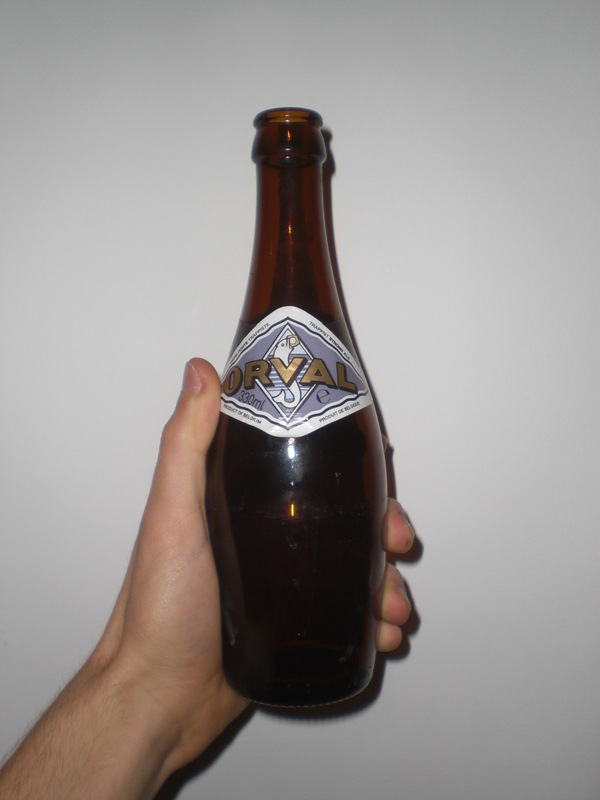 Orval is brewed in a Cistercian monastery in Belgium, and was founded in 1132. The beer started commercial production in 1931 but has been brewed at the abbey for centuries. With such a long history, those monks have certainly learned how to perfect the art of making a damn good beer. 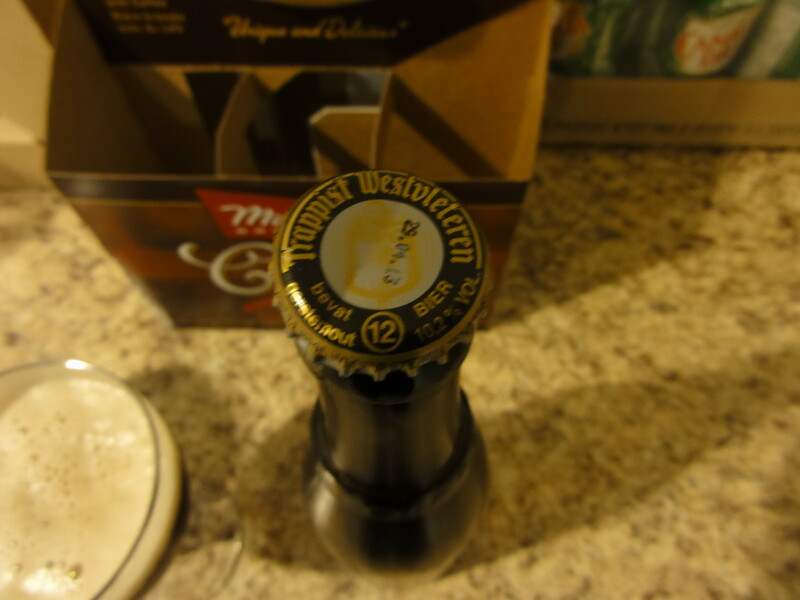 Solid Trappist beer: 4 heads. For my first couple of posts on Beer(s) For Breakfast, I think it’s only suitable that I write a review of my favorite beer and my least favorite beer. So I’m going to start things of with my favorite, Chimay Premiere. Instead of trying to sound sophisticated and pompous by writing a beer review that reads like a wine review, I’m going to explain why Chimay Premiere (or Chimay Red) is, in my humble opinion, the best beer in the world… that I have tried up to this point, at least. I’m not going to ramble on about how it’s made, what ingredients are used, etc. because that’s already been done. If you want to know about all that, which I would definitely encourage, start here. Chimay wins in all categories. First of all, it’s not pasteurized… so you get all the delicious pathogenic micro-organisms. Second of all, it’s made by Belgian monks (which means its blessed and that God approves and probably drinks it himself). As for appearance, it’s copper-coloured and, if poured correctly and into the right type of glass*, yields an extremely creamy head. It has a mild fruit scent, smooth texture, bold flavor, and just the right amount of bitterness in the aftertaste. And in case you’re wondering, you ARE supposed to drink the sediment. Anyway, that’s all I’m going to say in regards to describing the beer because, as stated earlier, I don’t want this to sound like a wine review. Before going out and trying this for yourself, keep in mind that acquiring a taste for specialty beers like this one takes time. You need to immerse yourself in beer culture to really understand it and develop a palette. That sounds really lame, but it’s true. You can’t expect people who have only ever had ordinary domestic beer to like something like Chimay. It’s complex and aromatic… something that most common beers are severely lacking. If you’re a Molson fan, try something like Leffe Brune before investing in Chimay… it’s not as good, but you’ll get the idea of the kind of flavor you can expect from Chimay and most other Trappist Belgian beers. Chimay is great for all seasons. The hints of fruit and the sweetness of its flavor makes it ideal on a hot summer day, yet its bold taste and higher alcohol percentage (7%) makes it a great winter beer as well. It comes in two sizes, 750 ml and 330 ml. As far as I know, the 330 ml one is only available in the Chimay gift set which makes its appearance at the LCBO around Christmas time. I would recommend the 750 ml anyway. You can fill your chalice up twice that way. Also, it’s great for sharing (this is only recommended if you have two chalices). Chimay is available only at select liqour stores, but you can go to the LCBO website and enter it in the search thing to find the nearest store that carries it. If you’re not sure about Chimay yet, try Leffe first (the Brune, not the the Blonde… they’re completely different), see what you think of it, and then make your decision. If you don’t like it, that doesn’t necessarily mean that you’re a chump, it just means that your palette isn’t refined enough… or that you’re a chump. I give Chimay Premiere 5 out of 5 Paul Westerberg heads (obviously). Paul definitely approves. He would drink this for breakfast anyday. 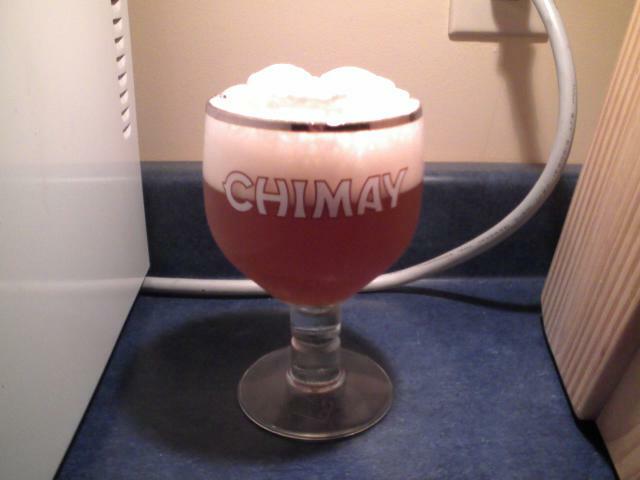 * Chimay has it’s own chalice. I would recommend picking one (or more) up. They’re great for almost any type of beer other than stouts that need to been pounded into a pint glass. I say this because they’re wide and allow the beer to breathe so you can really take in the aromas… plus it has a stem so you can hold onto that and not the body of the glass so that the beer doesn’t get warm.